I admire In-N-Out Burger as a business. It’s still family owned, they treat their employees well and, operationally, they keep things simple and efficient by not trying to be all things to all people – unless you want some variation of beef, cheese, buns, fries or maybe a milkshake, there is nothing for you here. I’m not even sure they offer mustard (I didn’t spot any at the condiments counter, though I believe they add them to some burgers). And, what they do they do well- everything is freshly prepared and cooked, but they still manage to serve customers relatively quickly. 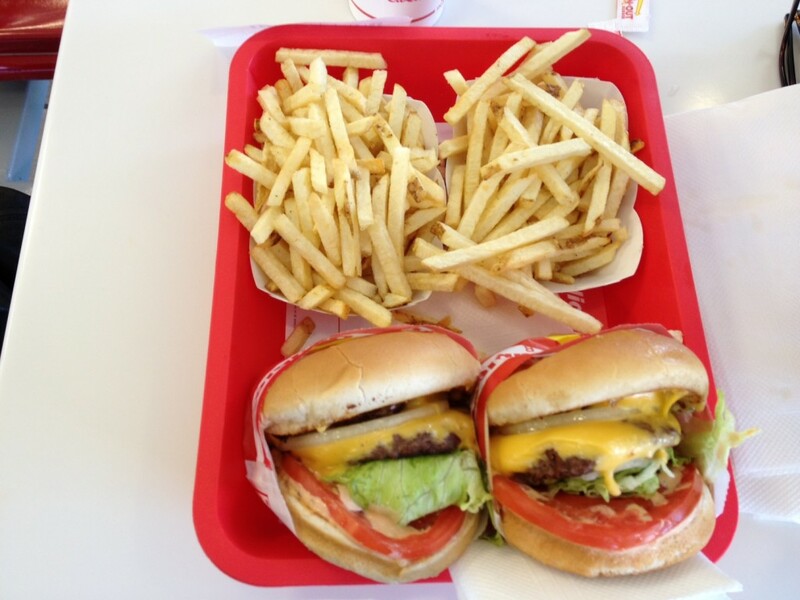 There is no real question about whether In-N-Out is awesome – it is. This place is a West Coast institution, as the always-crazy scene at the Barstow location (about midway between LA and Vegas) will attest. The question really is what’s so great about it? To ponder this query, Husband and I both ordered Double Double (double meat, double cheese) combos on a recent visit en route to Death Valley. We had them with tomato, cheese (American, I think), lettuce, onion and sauce (a variation on thousand island). The bun was standard and the beef patties were neither especially thick or particularly meaty tasting. The whole thing, when you dissect it, seems unexceptional. And yet it works, and I think it’s because (1) unlike most fast food places, In-N-Out doesn’t cook their meat to within an inch of its life – our burgers were prepared around medium well, and (2) all the elements work really well together as a whole. While I don’t think In-N-Out measures up to, say, Shake Shack in New York (which, in fairness, is a bit more poncey about the beef they use), the freshly prepared, juicy and tasty burgers always makes In-N-Out well worth the visit. Destination Burger: Yes, without a doubt. Optional French Fry Rating: OK – thin (the way I like) but not crispy enough. Today’s Weigh In: I’m on holiday – the calories and fat don’t count. Book-marked, I really like your blog! Hello there admin, I just wished to actually make a short observation to say that I adored your blog post. Thanks! Really fascinating post. Really interesting and well penned blog. In-N-Out rocks! I just wish I could have brought it with me when I moved to the midwest recently. BARSTOW, CA: In-N-Out Pretty nice post. I just stumbled upon your weblog and wanted to say that I’ve really enjoyed browsing your blog posts. In any case I’ll be subscribing to your rss feed and I hope you write again very soon! 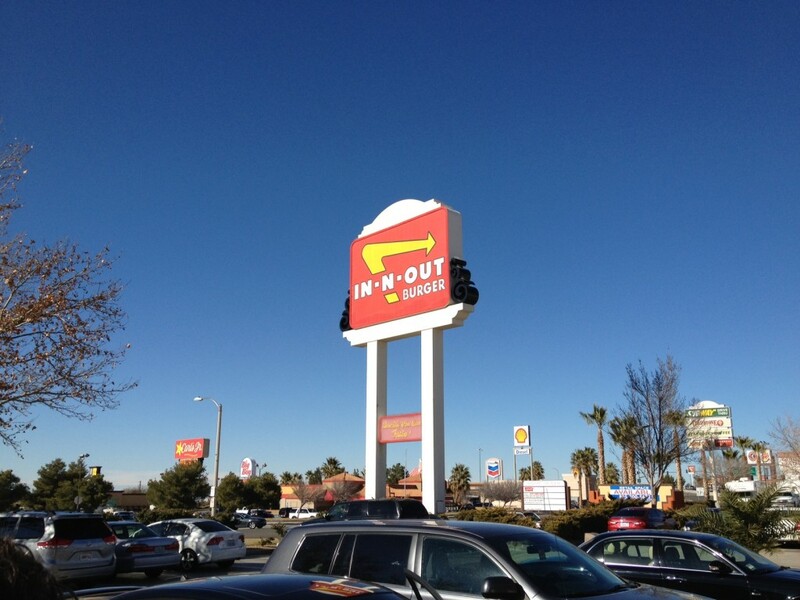 BARSTOW, CA: In-N-Out Very nice post. I just stumbled upon your blog and wanted to say that I have truly enjoyed browsing your blog posts. After all I’ll be subscribing to your rss feed and I hope you write again very soon! I love the header on your internet site!